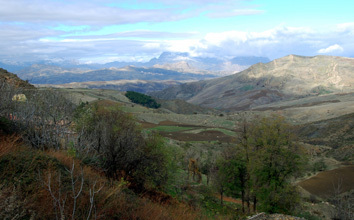 This landscape is more reminiscent of Scotland than Africa, but is a valley in north-eastern Algeria. Accounts of lions in this region continued up to the early 20th century (Black et al 2013). One of the more memorable regular encounters by local people with lions used to occur in this region. The stream above the valley runs near a track which was frequently used by local people taking goods to market. 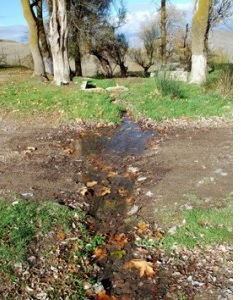 However the stream, although fairly unassuming (see the photo below) was an importnat water point for lions. This meant that people regularly had to drive lions away from the area with sticks when travelling through the area. A colleague in Algeria has collected verbal accounts from an old man who used to travel this route in the 1920s. The scene is reminiscent of the encounters in the Gir Forest in Gujarat, India which the local Maldhari people experience with the Asiatic lion (Panthera leo persica). A Maldhari and his livestock in the Gir forest. He has a stick to steer his animals and to protect them and himself against lions. This entry was posted in Ecology, History and tagged Algeria, Asiatic, barbary, Gujarat, India, lion on December 15, 2014 by Simon Black. The last pockets of habitat where lions were seen in the mid 20th century (1930s – 40s). Well-known populations in central Morocco (Ifrane) and western Algeria (Oran) had already disappeared. 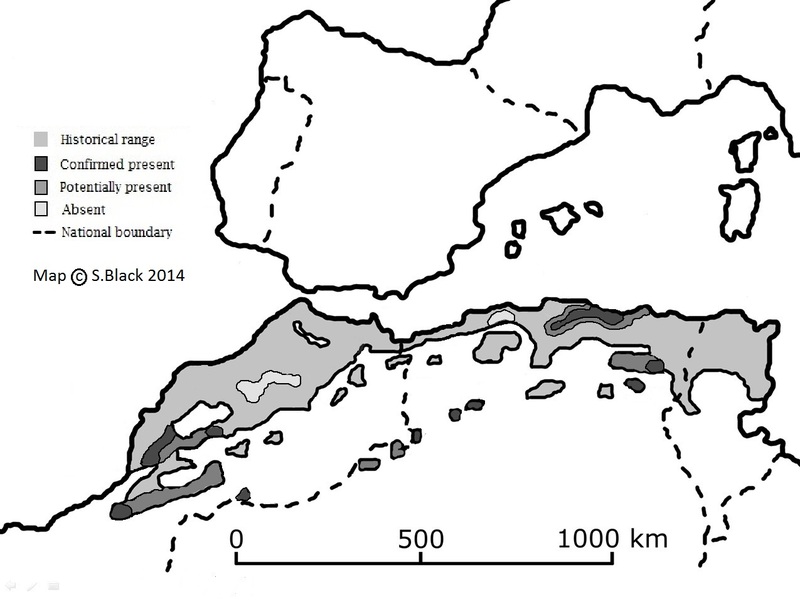 Although there is no definitve survey data for barbary lion presence in North Africa, it is possible to use the information from reported sightings to map the final decline of the species. A quick summary is given in the figure opposite. 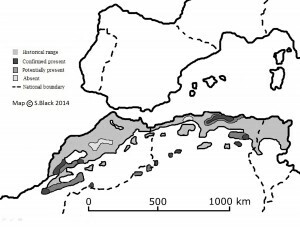 The mid-grey expanse is the Maghreb ecosystem which was suitable habitat for lions stretching from south-west Morocco through to north-east Tunisia. The lightest grey patches in central Morocco and north central Algeria indicate where lions had been present up to the 1920s. The darker grey regions indicate where the last micro-populations survived from the 1930s up to the early 1960s (at the latest). The important last populations may well have been completely isolated in North Setif, Biskra and Batna, the Saharan Atlas, southern Morocco on the Saharan fringe, and the southern High Atlas. It is possible that lions traversed the arid zones between the High Atlas, the Saharan fringe and the Saharan Atlas mountains, but the rest of the Algerian populations in the east were probably quite separate after the early 1900s. This entry was posted in Extinction, History and tagged Algeria, Atlas Mountains, barbary, Extinction, extirpation, lion, maghreb, Morocco on December 4, 2014 by Simon Black.